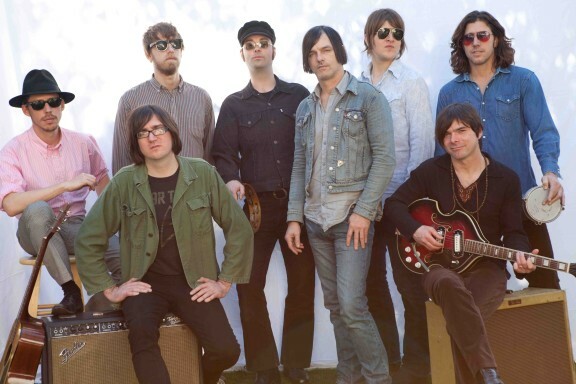 Notorious 60s garage-psych revival band, the Brian Jonestown Massacre, are hitting our shores again for the first time since early 2010, promoting their latest album Aufheben. To celebrate and educate we have compiled a listed of BJM’s, top ten tracks (as we see it) that everyone should know before heading to a gig near you. The band, fronted by songwriter / multi instrumentalist Anton Newcombe and a host of revolving band members (including long-stayers such as Matt Hollywood, Joel Gion and Frankie Emerson) have gained a large cult following since the movie DiG! which documented the group and their relationship with the Dandy Warhols. The film was panned by both bands as being inaccurate and misleading, but provided significant exposure for both bands – particularly BJM. Fans old and new will be pleased to know that Anton has cleaned up his act since the band’s wild heyday and that the drug-filled on (and off) stage disputes are a thing of the past. From their early 90s psychedelic shoegaze style, right through their Stones/Nuggets/80s Psych Revivalist phase (à la Galaxie 500) and beyond, Newcombe and the Brian Jonestown Massacre have consistently impressed audiences with their prolific output. Their ability to replicate the sound and essence of notables such as Dylan and Jagger/Richards, whilst remaining fresh and releasing songs these artists would be envious of, has earned them acclaim and notoriety. After the heavy experimental leanings of the last couple of albums (which have been tough for some fans to grasp), the band have indicated a return to familiar form on new tracks such as ‘Stairway to the Best Party in the Universe’, and ‘I Want to Hold Your Other Hand’. The Brian Jonestown Massacre’s back catalogue is intimidating but have a listen to some of these. If their 2010 Australian tour and recent set lists are anything to go by, expect plenty of classics thrown into the mix! After the Dandy Warhols wrote the scathing ‘Not If You Were the Last Junkie On Earth’ about their pals, Matt Hollywood responded with his own bitter ‘tribute’ / parody. The resulting track is an altogether less-polished track than the Dandys would release (as would be expected from BJM), and manages to capture their essence in under three minutes (complete with the trademark “woo hoo”s), whilst still sounding like The Brian Jonestown Massacre. This slow burning psychedelic rocker is a fan favourite. With its psychedelic 60s lead guitar, tambourine and breathy vocals, it sounds like it could have been released in 1968. One of the best tracks from Thank God For Mental Illness. This track is an acoustic-based ballad, with some nice vintage guitar licks that run over the top. Recorded at a time when the band pumped out two minute raw pop gems seemingly by the minute. A compilation of the best BJM tracks would be incomplete without ‘Servo’, from 1997′s Give it Back! A catchy guitar riff and heavy use of the flute. Awesome. The band shone during this 1998 session on John Peel’s radio show, and it isn’t any clearer than on this somewhat sombre rarely heard track. Find it on Youtube, or another version on their career spanning compilation Tepid Peppermint Wonderland. An early track from their debut, Spacegirl and other Favorites, that revolves around a repetitive guitar riff and off-kilter vocals. ‘That Girl Suicide’ showcases some of the band’s early shoegazing influences. Featured in the movie DiG! and a long-time fan favourite. This one is heavily influenced by Dylan, complete with harmonica and acoustic guitar. Reminiscent of a more raw version of ‘The Times are a Changin’’. What a tune! The title of the album from which this track was taken (Their Satanic Majesty’s Second Request) clearly shows the bands’ influence at the time: the Stones and their contemporaries. Allegedly recording on a shoestring, the band pumped out three fantastic albums in 1996, each full of tracks as good as this one. Reminiscent of the Dandys’ ‘Godless’, but more than holds its own. With its tremelo’d guitars and laid-back vocals by Newcombe, it doesn’t offer anything new, but you’ll be humming it for days. This new track from BJM bares a very strong resemblance to ‘Paint it Black’ by the Stones, but with more drone and much darker. A true return to form! The Brian Jonestown Massacre/Raveonettes Australian tour kicks off on May 17 in Sydney and will be hitting all the big cities! Find out all the details on the facebook event page! “She made me” must be in this list ! also Wasted, Super F*ucked, Everyone Say, I love you – entire Methodrone album. Vancouver, commodore, may 24, see you there. Actually, Vacuum Boots is the opener of Take It From The Man, not Their Satanic Majesty’s Second Request. and about 50 more . . ..
OH MY GOD. I’m so happy this was brought to my attention. How did I not see this until now. BJM were my LIFE for most of Year 10,11 & 12. Seeing them live in 2010 is still to date one of my most amazing live music experiences and not going to see them last year is one of my biggest regrets. You are missing two of my personal favourites though, ‘Spun’ and ‘Wisdom’. Love! also MANSION IN THE SKY is criminally underrated. Three out ten ain’t bad though when it’s the BJM we’re talking about, and I’m ok with VACUUM BOOTS and SWALLOWTAIL being included as well. But it’s great to see these guys get mentioned at all!!! I’m flying to LA to see them this weekend, can’t wait! BJM is a great band and my only regret concerning them is that I had not discovered them sooner in life! Junkie was written about Courtneys ex-girlfriend, Gretchen, who he found out had started doing heroin with the lead singer of Nero’s Rome when Courtney went on the Dandys went to London to play at the Astoria for the first time. But…. close saying it’s about BJM. Best bunch of talented people ever, the tamborine keeps them together. Stumbled upon this site when listening to my BJM albums today. Blissful, timeless songs that never fail to get me on my feet dancing like a maniac. Anton Newcombe lives and breathes his music. Impossible to pick favourite songs. There are too many. Saw them in Sydney in 2008, but have missed later gigs here to my great disappointment. WHEN I WAS YESTERDAY ! Yes. Underrated. Hard to pick a favourite, but that’s one of them. Of course, I again qualify this changes every time I listen to them, which is constantly. How Anton can maintain this type of power over 25 years is beyond comprehension. I hope he’s still at it long after I’m gone, because this planet needs his unfathomable skill for the next hundred generations. Oh…. I can never shut up about the music this man creates. What always seems to fall by the wayside in these discussions are the INSTRUMENTALS. Anton Newcombe can trigger as much emotional response, provoke more intense reaction than any musician I’ve ever experienced (not talking classical music here, but it applies as well) even when he keeps his mouth shut. I would challenge any one who is a grateful consumer of BJM to take a neophyte, sit her or him down, and play “You look great when I’m Fucked Up”, “Some Things Go Without Saying”, or, just released, “Oh Bother” and tell me the reaction you observe isn’t somebody who’s truly had their mind expanded, their heart cracked open. I would like to see a list of favorite instrumentals as well. No words, just Anton in the studio. I’ve put in my three. Completely agree with your comments Tom. Something’s go without saying is incredible. Even non-BJM fans always seem to enjoy it. Couldn’t agree more. I’m a sucker for a strong instrumental, and BJM’s are among the best. “Panic in Babylon” might me the most perfectly realised instrumental ever, I am in awe of that piece of music. Yep. Then there’s “Oh Bother.” May the well never run dry. This entry was posted in Music and tagged anton newcombe, bjm, brian jonestown massacre, the raveonettes, tour. Bookmark the permalink.